As big pharma struggled with the delicate balance between spending and revenue, mid-cap speciality and big biotech groups surged ahead and are now firmly established as having the most efficient businesses in biopharma. 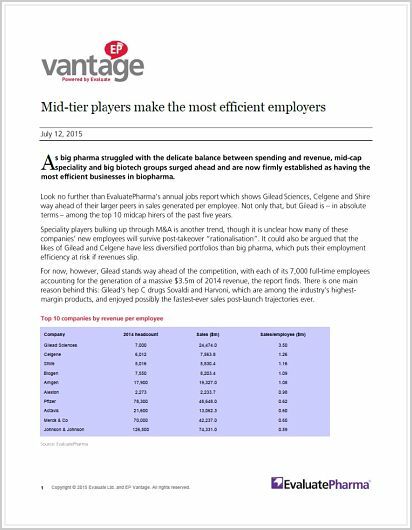 This year's edition of our annual jobs report shows Gilead Sciences, Celgene and Shire are way ahead of their larger peers in sales generated per employee. Not only that, but Gilead is – in absolute terms – among the top 10 midcap hirers of the past five years. To download this report, please confirm your email address on the form.